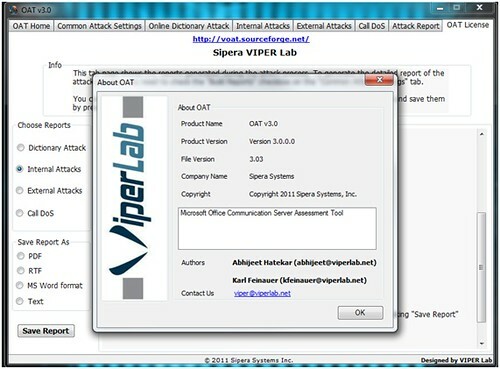 OAT is an Open Source Microsoft OCS Assessment Tool designed to check the password strength of Lync and Microsoft Office Communication Server users. After a password is compromised, OAT demonstrates potential UC attacks that can be performed by legitimate users if proper security controls are not in place. We first wrote about OAT when it was v1.0 and just came out in 2009. OAT has a user friendly tabbed interface that begins with a password strength test feature. Once the OAT user has successfully elicited the password, attack modules from subsequent tabs can be used for launching UC attacks against valid, registered Lync and OCS users.